Baseball, a favorite American summer activity for kids and adults, requires speed, throwing power and batting strength. Try the following exercises to develop your skills in these areas. This is a great exercise to develop batting power. Stand sideways to a wall or partner. 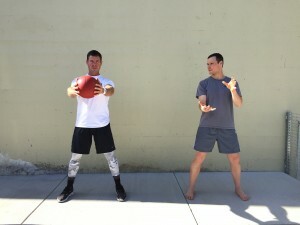 Hold the medicine ball with both hands and position both hands to the side of your body opposite to your partner or wall. Now throw the medicine ball. Catch and repeat for 30-60 seconds each side.